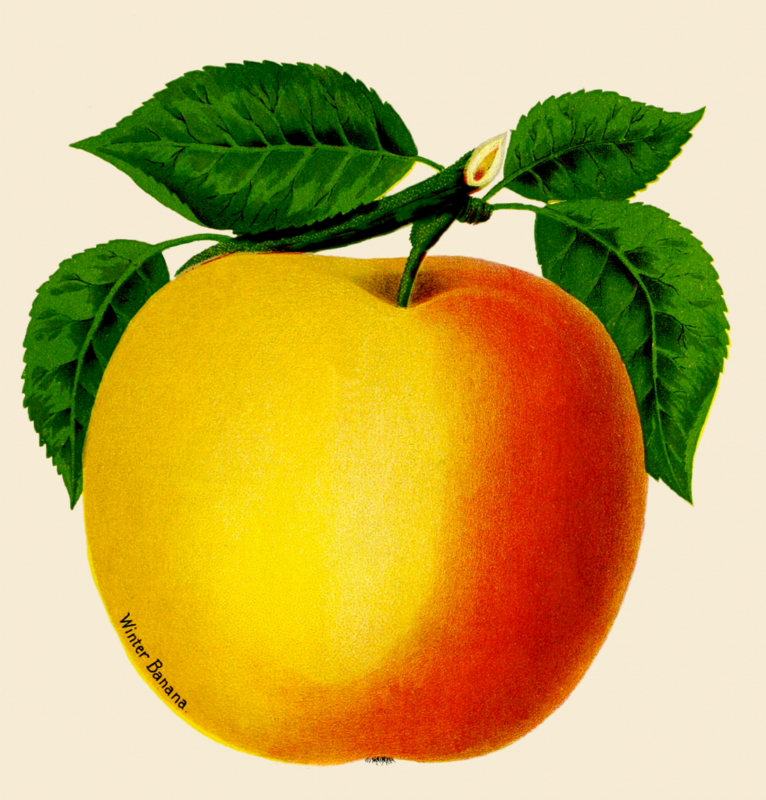 This beautiful yellow apple drawing comes from the River Raisin Valley Nursery catalog of 1893. They were introducing the Winter Banana Apply introduced to the marketplace in 1890 by a company from Michigan. The apples were a lovely golden yellow color with orange red shading. The catalog described these apples as the ‘finest flavored and perfumed apple yet discovered.’ They claimed one of these, when placed on a table, could fill an entire room with a sweet perfume. Grand words indeed for an apple that actually tastes of smells of bananas. One heirloom apple farm explained about the taste and smell of these beautiful and aromatic apples. Even grander is this beautiful drawing that River Raisin Valley included in that 1893 catalog. A single, tempting ripe apple, with a few of its leaves, looks good enough to eat. While not in full-color, we also found a vintage black and white drawing of a winter banana apple tree. It’s a fully-grown tree heavy with fruit. You could add color and turn them into pretty yellow apples or the color of your choice.